I no longer drink it, my taste have changed. Do have a few mentioned in stock for buds. Prefer Utopias by a wide margin now. Nice! i'll look it up when i get a chance...let us know when you get it! Favorite: Macallan 12 yr Sherry Oak, if I'm in the mood for something smokey then it's Ardmore Highland single malt. It took forever to find a source for the Macallan in my area, but a new retailer opened up and they are stocking most of the sherry/fine oak ranges. When I was a young buck a good friend of mine corrupted me with Laphroaig. I don't drink much any more except for a good French claret or burgundy. If I have a single malt now I drink Suntory Yamazaki 12 year. Nice whisky...the Macallan, very solid. Craggenmore 12 is not as good, but similar (imho) and far less expensive. Hi Roger, have you tried the Yoichi 10-year? I have tried a number of the Japanese whiskys...i have found Suntory quite expensive here in comparison to others of similar appeal...i found Yoichi very, very memorable. Being Scottish, it’s always a bit embarrassing to admit that I don’t like whisky. My father was a big fan of the single malts, as I believe they are called. Shortly after he died, my sister insisted on getting a “wee dram” of whisky for him whilst he was in his coffin. He was a fan of Glenfiddich (glen-fid-ik, not glen-fid-ich); I'm told that it's a nice one. Hi Lloyd I will give it a try,thanks. 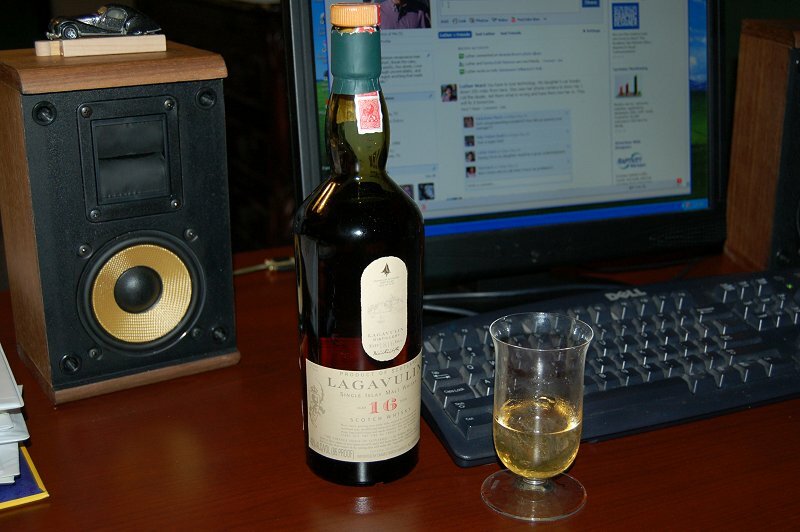 In recent years, I have really grown to like Lagavulin. This one I would not suggest for anyone starting out. This is my all time favorite Lagavulin smooth buttery and a bit of honey at the end. I had a Scottish friend who went back every few years & bring back a sampler. It had Oban , Lagavulin, Cragganmore, Balvenie, Cardhu, Dalwhinnie and Talisker of all I liked Oban & Lagavulin. My scotch of choice at a young age was "The Glenlivet" but my tastes have changed.I Also drank the king of iodine Laphroiag you really have to aquire a taste for that. My Avatar is proof that the "Holy Grail Exists"
Agree. Lagavulin 16 is stunning, particularly for the money. Have you tried the Springbank 18? one of my favorites. I also just got the Springbank 21 which was released in December and has already sold out. Breathtaking. If you enjoy the smoke, try the Ardberg Supernova. You guys have been making me quite thirsty this week. I'm going to BevMo this weekend to pick up a few of the recommended spirits. If there is something in the price range of Lagavulin 16, my personal favorite, that you think is better I've gotta get me some. Honestly, that is very, very dificult to do. 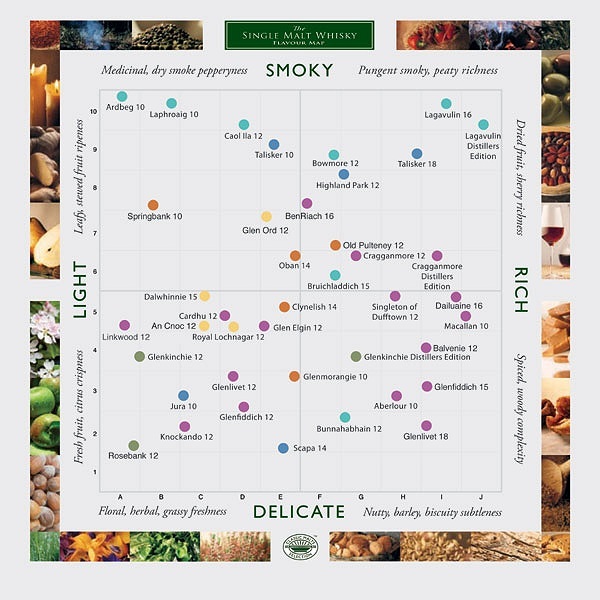 IMHO, Lagavulin 16 is amazing for the price...and also superior (to my personal taste) to the 12 and the Distiller's Edition...which costs more (at least here). Even the Whisky Shop where i am (which has hundreds of whiskys)...said the same. You might try a 'small barrel' Springbank 10 which was just released...they mature faster in smaller barrels so apparently smoother (i am going over to get one this weekend), and the cost is maybe 10% more than Lagavulin 16...but supposedly very, very close to the Springbank 21...which ranks in my personal top 5 of all time and i keep record (as per my ranking list above) quite carefully. that is super cool...i have had/owned exactly half of what's on that chart and found it quite a lot of fun to track it...at first quick glance, i disagreed but when i looked at the four side definitions again, i now agree. I have only recently started drinking Scotch. I find my preference is the bottom right (or #2) quadrant but I've sampled from the others. I do like Macallan's fine oak series - the 15 and 17 year are very smooth. Also Glendronach 12 and Balvenie Double Wood 12. For those willing to sample blended Scotch, Compass Box is producing some compelling blends, some malt only, some with grain whisky. Spice Tree is very nice, complex blended malt. I am looking to try Hedonism and Oak Cross next. Asyla is a very smooth, easy to drink blend at a fair price. For higher profile blends, I am really liking Dewar's Signature. Johnnie Walker Blue is good but pricey. My next single malt Scotch purchase will probably be Highland Park and I'd like to try a Benriach and an Ardbeg. I have a Glenlivet 16 Nadurra and a Glenfiddich 18 yr that I have yet to open. Hi...the Glenlivet 16 Nadurra and Glennfiddich 18-yr are both excellent. The Glenlivet you should find quite sweet, reasonably smooth and the Glennfiddich quite smooth, full bodied with a 'clean rich taste'. If you are going to try a Highland Park, the Highland 18-yr is a bit more money but worth it...my favorite of the Highland Parks. Ardberg makes several good whiskys...some people say their older stuff is quite different (and generally better) than their newer...i think that is only partly true...the newer Ardberg Supernova is stunning, very smoky, but stunning...a sweet, thick smoke, not rough at all. Just my personal observations...enjoy! #1 - Talisker Distiller Edition - incredibly complex, notice new flavors in every sip, amazing! looking forward to winter when I tend to enjoy the beverage the most! I have the Talisker Distillers - a gift. Laphroig 18 year and 10 year. 18-yr is beautiful...just finished the last drips of it a few days ago! Fortunately, have a 21-yr Springbank, 10-Yr Small Barrel Springbank (they mature faster in small barrels so taste closer to 18-yr)...so plenty of good peat left. I like the Dalmore and Glenmorangie Artein.